Theodore's recipe reduces the amount of sugar and pastry, so the nutty, spicy flavour comes through more dramatically. For the syrup, place 200ml water, the honey, sugar, and lemon juice and zest in a pan; heat till dissolved. Turn up the heat and boil until thick and syrupy. Cool and refrigerate. Mix together the walnuts, sugar and cinnamon. Brush a 30cm x 20cm baking tray at least 5cm deep with melted butter. Lay down a sheet of filo that has been cut to fit the tray, or use 2 overlapping sheets. Brush with butter, scatter with semolina and lay another sheet on top. Repeat until you have 6 layers. Scatter over ¼ of the nut mixture, then top with 3 sheets of pastry, treated as above. Repeat to make 4 nut layers. The top layer should have 11 sheets. Brush with butter. Set in the fridge for 6–7 minutes. Preheat the oven to 180°C, gas mark 4. 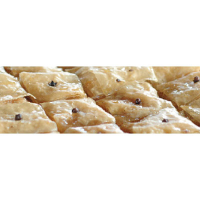 Divide the baklava into squares 5cm wide, cutting half-way down. Pierce each square with a clove. Bake for 30 minutes. Turn the oven down to 140°C, gas mark 1 and continue baking for 25–30 minutes until golden. Once the baklava is cooked, finish cutting through. While still hot, pour the syrup into the cuts.